The Critical Incident Planning and Mapping System (CIPMS) was created by the Washington State Legislature in 2003, and signed into law as RCW 36.28A.060-080. That same year, the state capital budget included over $4 million to map the state’s 460 public high schools. Given this legislative mandate, WASPC also obtained federal funding to develop standards and choose a contract provider to develop the software that is now known as Rapid Responder. In subsequent years, the Legislature funded the mapping of the remaining 1,700 middle and elementary schools. WASPC has now completed the legislatively mandated digital mapping of all K-12 schools. (An estimated 750 schools have actually been mapped more than once, due to new construction and remodeling.) Additionally, federal homeland security funding has been used to map the Legislative Building, SeaTac Airport, CenturyLink and Safeco Fields, hospitals, and other public and critical infrastructure sites. Beginning in 2009, the state Legislature funded the mapping of the entire state community college system, for $3.5 million. This work was completed in 2011. Other higher education campuses have not yet been mapped, but a study (Campus Emergency Preparedness Study 2008) conducted for the Legislature in 2008 estimated costs to include state and private colleges in the system. The mapping system provides information to first responders, including tactical pre-plans, satellite and geospatial imagery, interior and exterior photos, floor plans, staging areas, hazardous materials, utility shut-offs, and evacuation routes. Every law enforcement and fire department in the state can access this information via Rapid Responder to better respond to emergencies at schools and other mapped facilities. 1) Price would be $0.16 per sq ft to have a team come to the site, take all photos, add floorplans, personnel, etc. This would be a package that would be rollout ready, with no work provided from the school or district (example: 100,000 sq ft school would be $16,000 to rollout). Once information is added, WASPC will conduct a Pre-Plan Tactical meeting with local responders to determine a pre-plan. Any training would be provided when requested at no additional cost. 2) Price would be a flat rate determined by the sq ft of the building (100,000 sq ft or less is $1,000, 100,001 sq ft or more is $1,500). The fee covers the following: All training needed at the school or district level, Administrative oversite by the School Safety Support program at WASPC, and the Pre-Plan Tactical performed by WASPC with all Local Responders. The school or district would be trained in the following: how to add and update information, trained on the Easy Alert Program, and how to perform the Administration Functions of the Rapid Responder System. Once the training is complete, school and/or district personnel would be responsible for adding all the data and information to the Rapid Responder Program. Once information is added, WASPC will conduct a Pre-Plan Tactical meeting with local responders to determine a pre-plan. All training would be provided when requested at no additional cost. A critical part of each mapping process is called the Pre-Plan Tactical Meeting. WASPC facilitates a meeting between law enforcement, the fire department, and school or other site officials. A customized tactical response plan is developed to respond to a worst case active shooter incident at the site. This plan is represented with common language and icons on a site aerial and loaded into Rapid Responder for access by site and responding agencies. WASPC trains site and responder users across the state in how to use the system to access the information. (This is called Navigation Training.) Site users are trained to keep the information up to date, and how to use the system to document training, drills, chemical inventories, and revised emergency procedures (Administrative Training). WASPC manages access to the site, and provides “customer support.” Click here for training opportunities. Spokane School Shooter: Lewis and Clark HS, September 2003, school shooting incident resolved without loss of life. A series of videos describing how the system was used in this incident and other settings is available at http://www.preparedresponse.com/videos.html. Vancouver Bomb Threat: Evergreen HS, December 2008, mapping system used by three schools, fire department, and CRESA, the dispatch agency, to address bomb threat / suspicious devices incident. Pre-planning effectively executed—for example, students at the HS were not allowed to use their cars to evacuate; they were escorted to the pre-planned evacuation spot and bussed to safety from there. Cowlitz County Fire: During a warehouse fire on the Columbia River in Kelso, emergency officials used the program to estimate the extent of a possible chemical release to plan the evacuation of neighborhoods near the fire, in the event that a storage tank caught fire. Thurston County Shooting Threat: An angry caller threatened to shoot “everyone in the courthouse”. Facility went into a modified lockdown, while county staff printed site and floor plans from Rapid Responder for responding officers for use in sweeping the buildings. Monroe School District- In 2017-18 school year, the system was used 436 times to track all drills and incidents, ranging from missing students, bus accidents, drug possession, and threats of violence. Bethel School District- On December 5th, 2017 two students were shot while watching a fight just off of Graham-Kapowsin High School campus. Easy Alert was used by school and district staff to communicate with South Sound 911 and Responders to coordinate the response and family reunification process. Spokane Community College: The college used Easy Alert to communicate during an event where a faculty member needed medical assistance. The Rapid Responder system was accessed by Washington users 111,888 times in 2018. 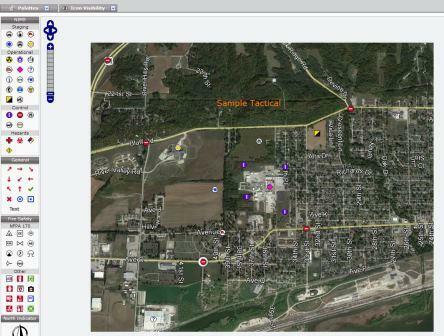 There are currently 2,448 school and public facilities mapped under the Critical Incident Planning and Mapping System. Washington Public School users report emergency preparedness drills and real incidents to WASPC using the mapping system. In 2018, they reported 8,519 drills and 1,331 incidents. Training Resources – A variety of electronic resources are available to vetted users of the School Safety Support Program (SSSP) system. These resources include PowerPoint examples, user guides, quick start guides, and other printed help materials. Training is provided on-site within the state of Washington. We also have a library of tabletop exercise scenarios and will facilitate or participate in tabletop exercises at your site.